The recorded legacy of numerous conductors can be patchy and even downright unsatisfactory. One feels something of that when considering Mravinsky, though given his general aversion to the recording process this shouldn’t come as a huge surprise. Nevertheless it would be good were his surviving studio discs to be codified in some way, rather than issued piecemeal. What we have here, in the case of the Melodiya box, is a mix of same old soup-bone, inaccurate data and valuably interesting. Let’s dispense with Melodiya’s soubriquet ‘Special Edition’ as it’s largely meaningless. This is a 5-CD set of previously released material. Things start promisingly with a reasonable transfer of his 1949 Pastoral symphony, something of a rare bird in the reissue market, and very well worth hearing. It was certainly canny programming to lead with this strongly plotted performance, its initial breathlessness soon giving way to flexible rubati and much characterisation. This is certainly ‘valuably interesting’. 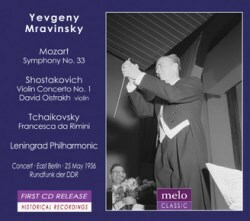 The 1962 La Mer has been issued on Russian Disc and the overture from Mastersingers, taped in January 1982 in the Large Hall in Leningrad – Melodiya only gives us the year and no recording locations – is on a JVC CD. The second disc gives us Brahms 3, which surely comes from 1973 not 1972 as per the booklet, Stravinsky’s Apollon musagète from 1965 – also picked up by JVC, which has done much to propagate Mravinsky’s legacy in Japan – and Debussy’s Prélude, similarly from 1965 and also on JVC’s books. I’m confused by Mozart’s Symphony No.39 in the third CD. It’s claimed to be from 1950 but that’s not true. He did record it in 1947 but this is surely the 1965 stereo version that JVC and Erato have already reissued. Has the 1947 set ever been reissued? The Swan of Tuonela has seen multiple reissues – Olympia did the honours in their Mravinsky edition, but so did JVC and indeed Melodiya itself, so this is definitely ‘soupbone’. Talking of which, discs three and five sport, respectively, Tchaikovsky’s Pathétique and Fourth Symphonies – the famous DGs from 1965 and 1960. Bruckner’s Ninth is also terra cognita thanks to several previous restorations, and Ravel’s Bolero is misdated – it should be 1952 not 1949. Tchaikovsky’s Capriccio Italien, recorded in 1950, shares the last disc with Scriabin’s The Poem of Ecstasy, which JVC reissued a good while ago. The three-language booklet does not serve the conductor’s widow, Alexandra Vavilina-Mravinskaya at all well. It’s a Putin-era return to the semi-intelligible notes beloved in the days of Brezhnev – two pages, in fact, one page of which is pure waffle. Doubtless it reads better in the two-page Russian original, and maybe even the French. Even so, this is a disappointingly sloppily produced box that contains one or two rarer gems from Mravinsky’s discography. 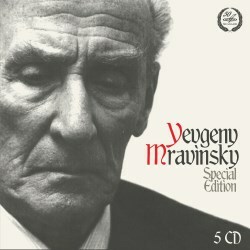 The companion disc captures Mravinsky live, on tour in East Berlin in 1956 with his Leningrad Philharmonic. Photographic evidence from the front of Meloclassic’s digipak shows that Mravinsky was physically capable of smiling. Mozart’s Symphony No.33 opens the disc. It was clearly a work he enjoyed performing, one of a relatively small number of Classical symphonies that he favoured, as he had recorded it for Melodiya in 1950. It receives a well sprung reading, with polished brass, and excellent, tight sectional discipline. Shostakovich’s A minor Concerto is played by the men who had premiered it the previous year in Leningrad. Oistrakh and Mravinsky also recorded it commercially for Melodiya in 1956, so one shouldn’t expect this East Berlin performance to be in any serious way divergent, and it’s not. However in his final years – when, for example, David Oistrakh recorded it in stereo in 1972 with his son Maxim and the New Philharmonia – his tempi had somewhat slowed, and his vibrato had widened. This East Berlin performance reinforces the astonishing virtues of the collaboration between orchestra, soloist, and conductor – a symbiotic whole, fortunately captured with excellent balance and sound. Applause has been excised. Tchaikovsky’s Francesca da Rimini was a staple of Mravinsky’s repertoire and he recorded it at least three times commercially – 1940, in a 78rpm set of three discs, in 1948 and finally in 1983. The cymbals are caught with great immediacy, so too the lower strings and exemplary brass, in this powerfully argued reading. This live performance – finely annotated and engineered - is making its first ever appearance on CD, so will be welcomed by collectors, even if there is nothing new to his discography to be found here.